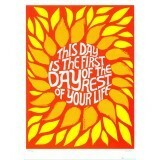 The words on this poster say: 'This Day is the First Day of the Rest of Your Life'. What could be more positive and life-affirming than that? 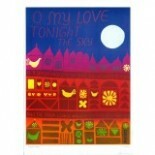 And because of the wonderful design and fab colours, we never get bored of seeing that message. This would be a really wonderful wedding or new baby gift, or just a great thing to have on your wall in your bedroom - what could be nicer to wake up to?